I have recently had the incredible opportunity to try out an enormous 132mm refractor telescope for some deep sky astrophotography. Connecting a DSLR camera to a telescope like this is something I never dreamed I would have the pleasure of doing. This is as good as it gets for fans of the apochromatic refractor telescope design. 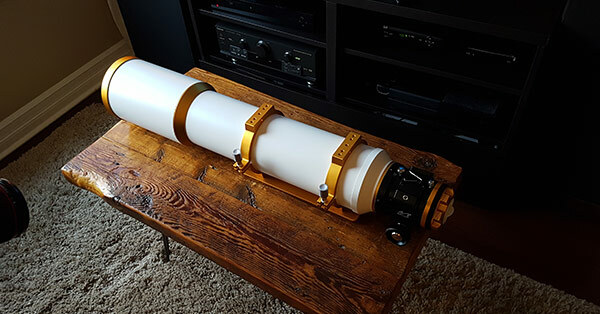 The William Optics Flourostar 132 is an F/7 triplet apochromatic refractor, designed to deliver superior deep-sky astrophotography performance. 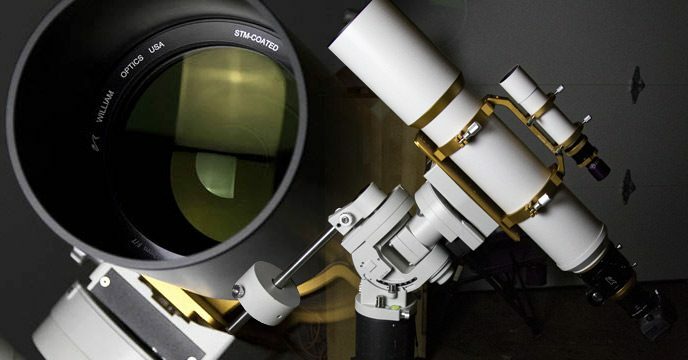 The massive 132mm objective lens means that it collects light from objects in space at an impressive rate, which can then be recorded by the sensor in your DSLR camera. With a limited window of clear skies available at this festive time of year, choosing a target that delivers satisfying results in a short period of time is worthy of some thought. After some deliberation, I ended up shooting quite possibly the most widely photographed DSO’s on the planet. Go figure! My image is comprised of about 1 hour worth of total exposure time using a Canon EOS Rebel T3i camera at ISO 800. The camera had a SkyTech CLS-CCD clip-in light pollution filter to reduce the city glow present in my backyard sky. 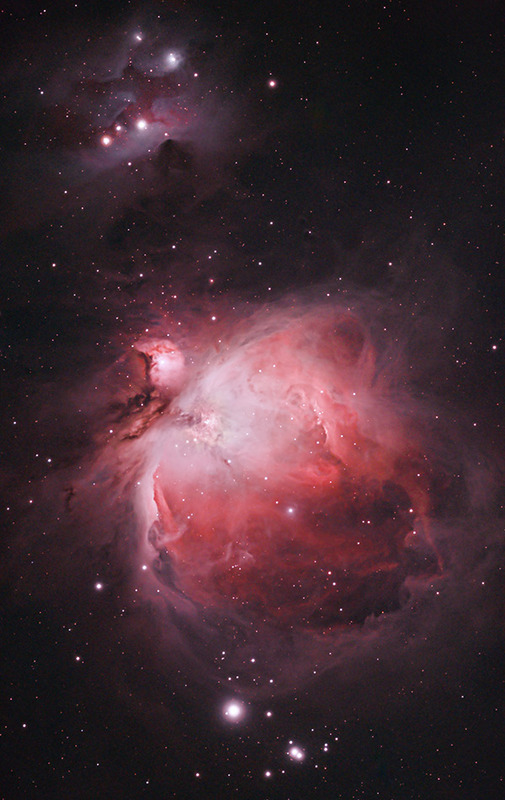 Shorter exposures of 15-seconds and 30-seconds were added to capture the bright core of M42. In true-color broadband photos, the outer nebulosity and details of M42 can be hard to pick up without soaking in some serious time under the stars. As you can see in the image, much of the outer hydrogen gas was captured in a short period of time. The Running Man Nebula (Sh2-279) is also shown to the left of Orion, which is a combination of a number deep sky objects. An open star cluster, emission nebula, and a reflection nebula to name a few. Those of you shooting with a wide FOV should consider including this object in your portrait of the area. I have photographed the Orion Nebula many times using various focal lengths. In my opinion, wide-field apochromatic refractors like these produce the most dynamic images of this region. 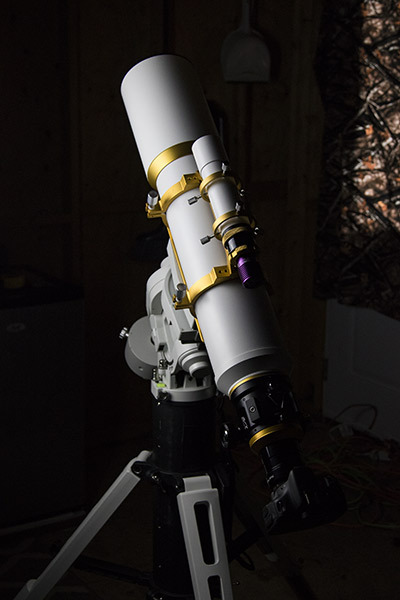 The Fluorostar 132 is by far the most impressive telescope I have ever used, period. The sheer size of this telescope can be hard to fully understand without a sense of scale. The gold accents that decorate this flawless white tube are a fitting choice considering the prestige of using the FLT 132. If you can handle the extra weight, the imaging performance of a refractor of this size is unmatched. Color correction, contrast, and clarity are all benefits of an apochromatic refractor. The triplet lens design and dedicated field flattener mean that the stars in your images are razor sharp points of light to the edge of the frame. At almost 20 lbs (without photography gear) the Fluorostar requires a heavy-duty equatorial mount to enjoy. Keep reading for a detailed description of this dream ‘scope. My image of the Orion Nebula used short exposures (2 minutes each) at a modest ISO 800, yet revealed the faint details of M42 usually only seen in much longer exposures. I am curious to see the amount of detail acquired when shooting ultra-long narrowband exposures with a cooled camera. I was pleased to see the field of view in this refractor is still quite wide, considering its longer focal length of 925mm. Medium-sized targets such as the Orion Nebula fit nicely in the image frame using a crop-sensor camera body such as a Canon EOS Rebel DSLR. Watch me shovel snow so I can set up my imaging equipment for a cold night under the stars! The weekend ended up clouding over completely, so it was my one and only chance to test the Fluorostar. Despite having a cooled CMOS camera in my possession at the moment (ZWO ASI294MC Pro), I opted to test the DSLR astrophotography performance of the FLT 132. The act of capturing deep sky images with an affordable DSLR camera will never lose its appeal. It’s where my journey began, and I will continue to shoot this way for years to come. 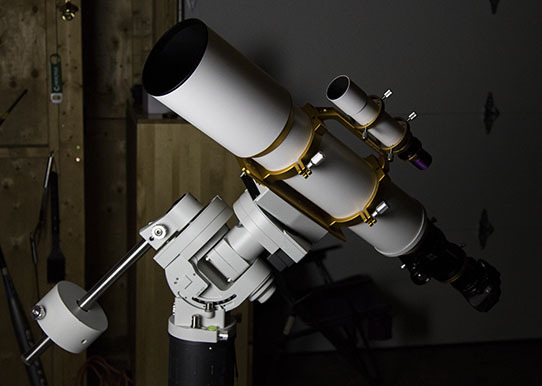 The William Optics Fluorostar 132 (FLT 132) is ideal for astrophotography due to the FPL-53 glass objective lens. This is a top of line material used in only the finest refractor telescopes. You may remember my review of the William Optics Zenithstar 61 APO, which also used this glass. The deep-sky imaging performance of that little APO is what sparked my interest in the Fluorostar. 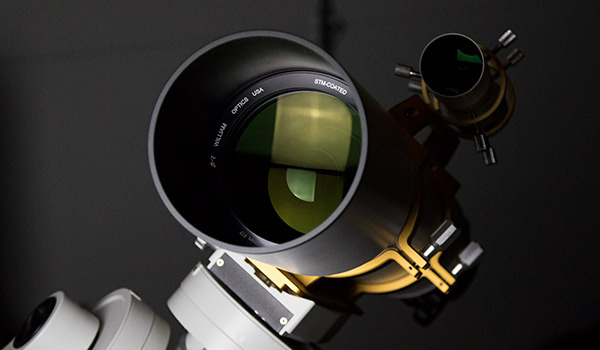 Using a William Optics Telescope is something that can only be described as a luxury experience. Every last detail of these telescopes has been carefully designed and implemented to improve the overall astrophotography experience. The small details that are only noticed when you experience a night of astrophotography with a product like this left a lasting impression on me. 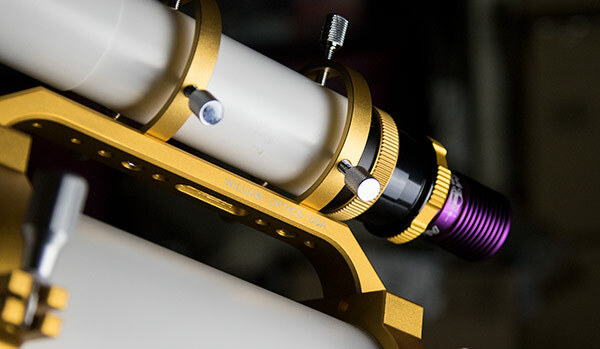 You can not deny the beautiful aesthetics of a William Optics telescope. When you invest in a tool that allows you to take incredible photos of objects in space, it holds a special place in your heart. Refractors like the FLT 132 reflect this admiration for the hobby and stand as a symbol of technological advancement in performance and design. The packaging of the FLT 132 included a soft carrying case with a thick padded liner. The William Optics logo and name were stitched in a vibrant orange color to the front of the case, and the big bag included heavy duty straps to easily transport the precious cargo inside. 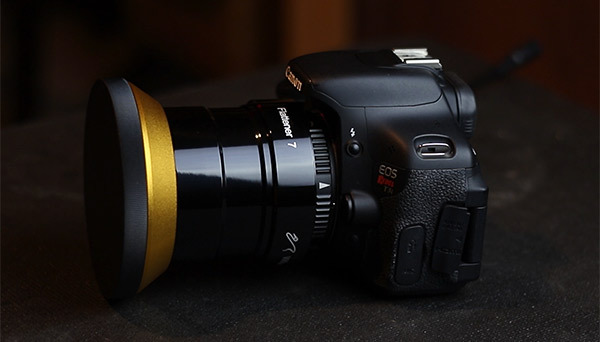 The tube rings, mounting plate, and lens cap are all finished in a luxurious gold color. When I first saw this telescope, all I could think of was that the FLT 132 was designed for a king. William Optics provided me with absolutely everything I needed to get up and running my first night. From the screws needed to mount the 50mm guide scope, to the impressive Flattener 7 dedicated field flattener, the attention to detail from this company is both appreciated and enjoyed. The dedicated field flattener/reducer for the Fluorostar 132 is the Flattener 7. 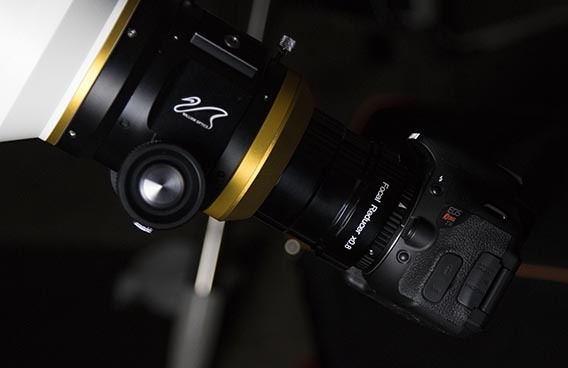 Its a large, beautiful, color matched accessory for the Flurostar, that connects your DSLR camera to the 3-inch focuser on the 132. The reducer threads directly into the focuser drawtube, and brings your camera view back to 740mm with the 0.8X reduction. This is definitely the most aesthetically pleasing flattener/reducer I have ever used. The color matched gold adapter ring completes the color coordination for the entire rig. It’s quite a sight! 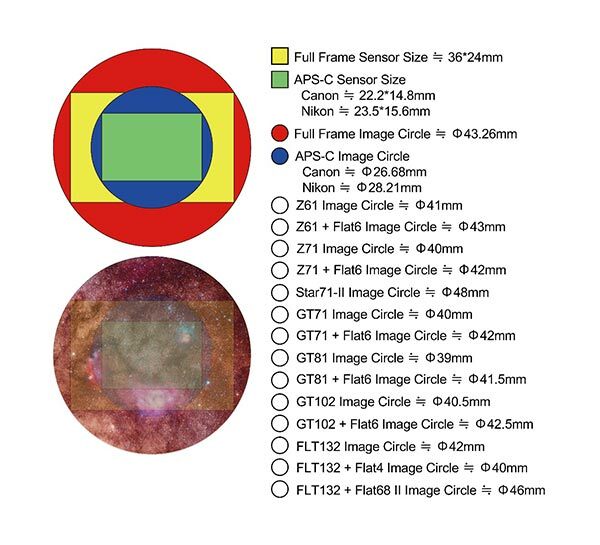 Full-frame DSLR owners will be happy to know that your image sensor will be completely exposed through the large image circle. My image is comprised of about 1 hours worth of total exposure time using a Canon REOS Rebel T3i camera at ISO 800. The camera had a SkyTech CLS-CCD clip-in light pollution filter to reduce the city glow present in my backyard sky. 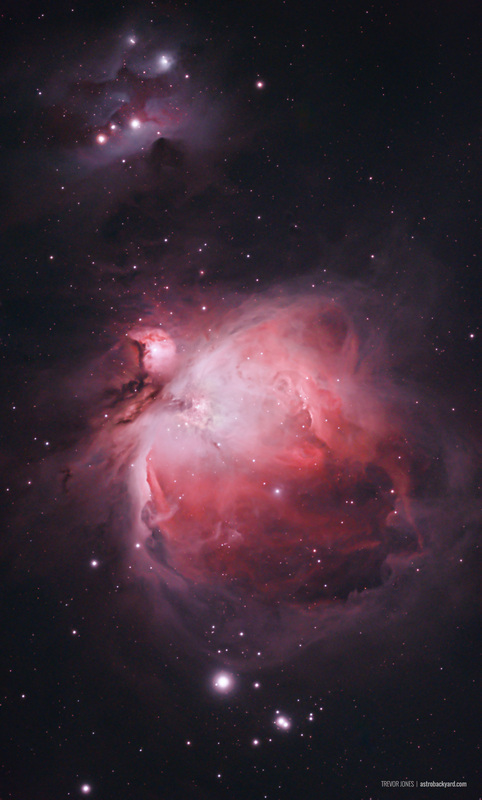 Shorter exposures of 15-seconds and 30-seconds were added to capture the bright core of M42. The amount of detail captured in each 2-minute sub at ISO 800 was impressive. The giant 132m aperture of this telescope at F/7 can pull in a lot of light in a short period of time. Each set of images were stacked separately in DeepSkyStacker and then combined in Photoshop. I hoped to gather at least 2-3 hours worth of exposure time on the Orion Nebula with my Canon T3i, but balancing issues plagued my imaging session. The new weight of the FLT 132 with my imaging gear attached was a brand new configuration for me on the iOptron CEM60. This meant that I needed to properly balance a load of nearly 20 lbs in both the Declination and Right-Ascension axis. I found an acceptable balance of the telescope before attaching the DSLR, and hoped the balance would remain stable once the photography gear and focus distance were applied. Unfortunately, the focus draw tube needed to be extended much further than anticipated, and this added backend weight through off my initial balance. The good news is, I marked this position and now know exactly where to place the imaging train when balancing the load next time. Finding focus with my autoguiding camera and a new guidescope took some time as well. I mistakenly thought that an extension tube was needed to find focus using the William Optics 50mm Guide Scope. The stars in my Altair GPCAM2 AR0130 Mono came to focus when I inserted the camera directly up against the rotolock adapter on the guidescope. This is the best-case scenario, as it keeps the autoguiding setup compact and cables are out of the way. This year was full of new astrophotography adventures both in the backyard and beyond. I had the opportunity to try several new cameras, mounts, and filters thanks to my partnership with Ontario Telescope & Accessories. I have a number of deep-sky imaging products just waiting to be tested and reviewed on the YouTube Channel. 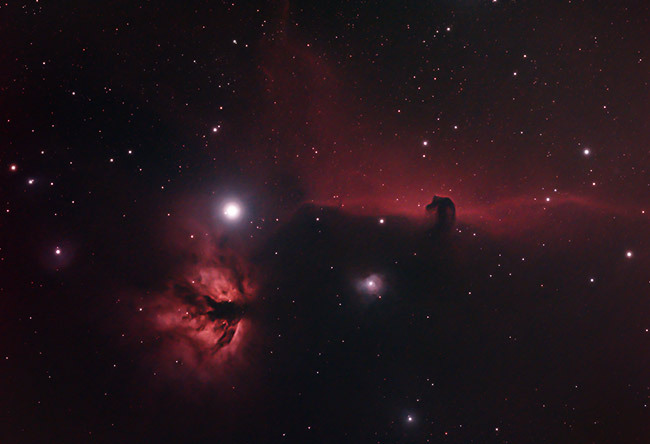 Update: I captured this image of the Horsehead Nebula using the FLT 132 on January 20, 2018. 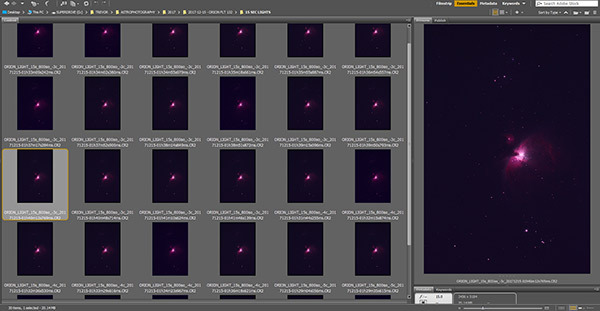 This image is comprised of 40 x 3-minute subs at ISO 800, using a modified Canon 600D DSLR. I look forward to sharing another exciting year of astrophotography with you all. For me, 2017 was full of surprises with some ups and downs. The one thing that remained constant was my unwavering love for the night sky and joy of sharing my experiences in the backyard with you. My journey through the hobby of deep-sky astrophotography continues to take me to new places and provides unforgettable experiences along the way. Happy Holidays and best wishes for the New Year! Thanks for your reviews and sharing your experience and knowledge. Looking forward to the next episodes on Youtube and the website. Best wishes for the New Year for you too! Wow! That thing looks like a beast of beauty! Love your new mount too. Can’t wait to get started with my first photos of the night sky. You’ve been a great help and inspiration with your youtube channel and web site. Keep up the great work. Greatly appreciated on this end down in North East Pennsylvania. Merry Christmas and a Happy New Year to all! Clear skys too! Have you looked at or considered an OAG? I have been looking, but not in the market as of right now. This could help with weight reduction. Maybe a topic for later on? Hi Danny! I have considered trying an off-Axis guider in the future. You’re right, it’s a great option for reducing weight. I think this would be very useful when shooting with my portable setup with the Z61 and SkyGuider Pro. Happy holidays from the Great Lake State! My es ed80 & t3i should be arriving any day now. You are making this new found passion of mine so much easier to comprehend. Well done Sir. Health, peace & happiness to you & yours. Once again a very good review. 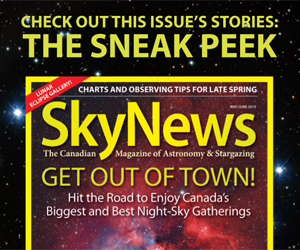 It’s helped stoke the fires of my passion for amateur astronomy which has waned of late. Unfortunately we’re going into summer here in Sydney, Australia, which is really humid so not the best conditions for astro-photography. I’m sure this is a dream come true and I’d also love an opportunity to do such a thing!